Fate/Stay Night follows a two week period in the life of Shiro Emiya, Shiro who is a good boy who helps out anyone who asks has a dream of being to make the world a better place and save people’s lives, however Shiro finds himself in the middle of a battle royal between magi and their summoned epic here servants. Shiro have little skill in magic himself manages the call fourth a Saber servant and thus he becomes one of the magi who is competing for the Holy Grail a legendary chalice that can grant wishes. Rin Tohsaka is a model student at her school, however she leads a double life and is also a very skilled magi and is competing in the Holy Grail War with her servant Archer. Although Rin does not have formal magical training she is very skilled, she is a perceptive and resourceful person and rather competitive. However under her tough exterior she has a good heart and therefore often contradicts herself. Rin’s Fraulein Revoltech portrayal is both good and bad. There are some aspects of the figure which are great, the design of her clothes, legs arms and torso are all very good and shapely, which is why I chose her for a custom figure, however there are aspects which had not attracted to own a Rink figure for Rin’s sake, one being her face is rather small compared to the size of her body and the facial expression is just not attractive, secondly she has few accessories and thirdly for some reason her feet are rather large in proportion to the rest of her. However she is not without merit, her hair is fantastically sculpted and I feel like it’s a bit of a shame for it to go to waste, but it will not go with my figure design, mainly because Rin does not have the ability to swap faces. Rin’s paint job is very good, her colour scheme is good and she is very character true. She has some nice shading on her hair, and her face is painted well. All small details painted very neatly as well, no complaints here. 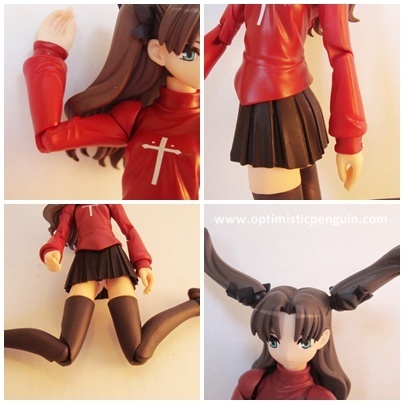 Rin’s accessories are painted good, some nice detail here and there. 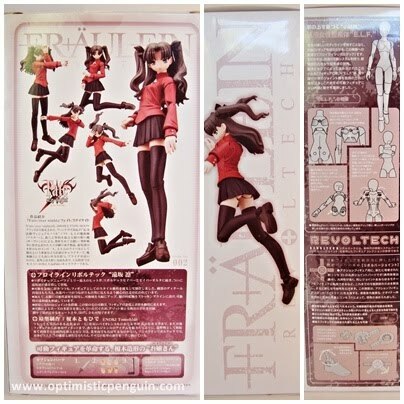 Rin uses the E.L.F joint system, which is used by all Fraulein Revoltechs. Her hands are on Revoltech joints, which move forwards and back and rotate, her elbow is a hinge joint, bending and straightening, a very natural movement, she has two joints at her shoulder, a swivel joint at the top of her arm allowing her arm to rotate, and at her shoulder a Revoltech joint so she can move her shoulder forwards back, up and down, and rotate. Her neck has a Revoltech joint, so she can look up and down and side to side. Under her chest she has a Revoltech joint, to lean forwards and back and twist. At her bottom/top of her thigh she has a Revoltech joint that moves forwards, but not backwards or side to side. Half way down her thigh she has a swivel joint to allow her leg to turn in and out. At her knee is a hinge joint, giving her a natural movement of knee going backwards. Lastly at her feet she has a Revoltech joint allowing her to point and flex, and can turn in and out. 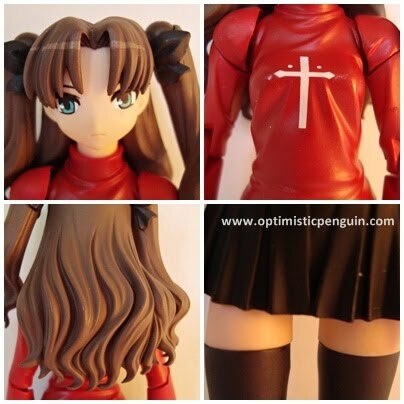 Rin also has two pony-tails which each have a Revoltech joint for added movement. 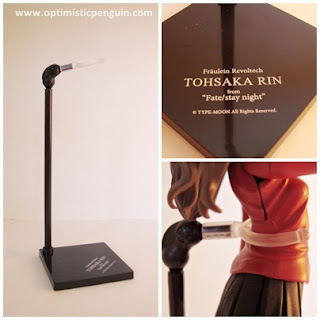 Rin comes with the standard Fraulein Revoltech stand, which is black and has her make (Fraulein Revoltech), her name and the series she comes from written on the base. The stand itself consists of a base a pole which pegs into it, and then a two jointed Revoltech Joint, which goes in the top of the pole and then into a U shaped holder. The thing to note about the Fraulein Revoltech stands is that they are too tall for the characters, and so when in the stand their legs dangle in the air, which is rather annoying at times. Inside the box she is held between two moulded pieces of plastic, with a space for her accessories, and her stand was in plastic bag attached to the back of her casing. 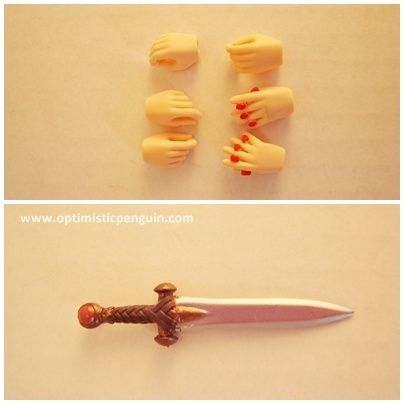 This is standard packaging for the Fraulein Revoltech line. She also came with promo poster of current and upcoming Revoltech action figures. Also take note of the authorized sticker, each figure should have one. I will break down my review of enjoyment into two categories, accessories, and play value. Rin has few accessories being one of the first in the Revoltech Fraulein line, she comes with her Azott sword and 3 pairs of extra hands, two for holding items, and two with her jewels, which she can fill with her mana and then detonate to use them for attacking and healing. And that’s it, no extra faces as the early Frauleins did not have this option. So not many accessories to play around with. As I mentioned before I got Rin purely to use for a custom figure, and so I didn’t really have a play around with her. But as she comes with so few accessories and has only one facial expression the play value is greatly reduced. Over all Rin is a nice figure but not an outstanding one, she has few accessories and has some body proportion issues but none-the-less on the whole she is pleasant looking figure. I don’t really recommend her unless you wish to collect all the Fraulein Revoltech line or Rin Tohsaka figures, as she also has a Figma counterpart which is much better looking with more accessories. 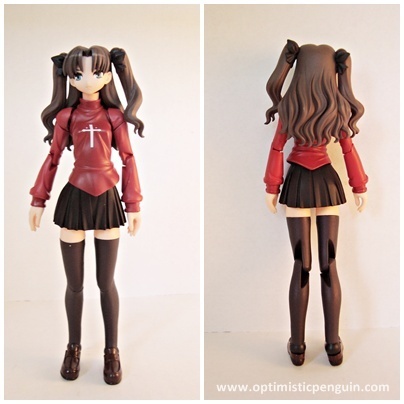 But Rin has served my purpose perfectly her parts are great and just doing a rough fit together last night I could see my custom figure was going to look great, so thanks Fraulein Revoltech Rin for donating your parts! 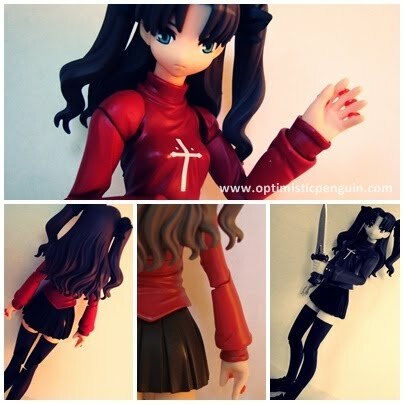 After watching the anime I am more a Rin fan than a Saber fan, perhaps I shall buy the Figma version of Rin.